After a year off, Pipe Dream’s drug survey is back! Click to take the survey. Jacob Hanna/Pipe Dream Photographer Local residents and community activists attend the first-ever meeting of Binghamton Tenants United. Students and local residents throughout Binghamton are searching for safe and affordable housing as the city adjusts to a changing real estate market and economic environment. On Thursday night, a group organizing to protect tenants’ rights held a kickoff meeting in Downtown Binghamton. According to their Facebook page, the Binghamton Tenants United will be a community space for renters to organize and discuss issues related to gentrification, rent control, evictions and landlords. 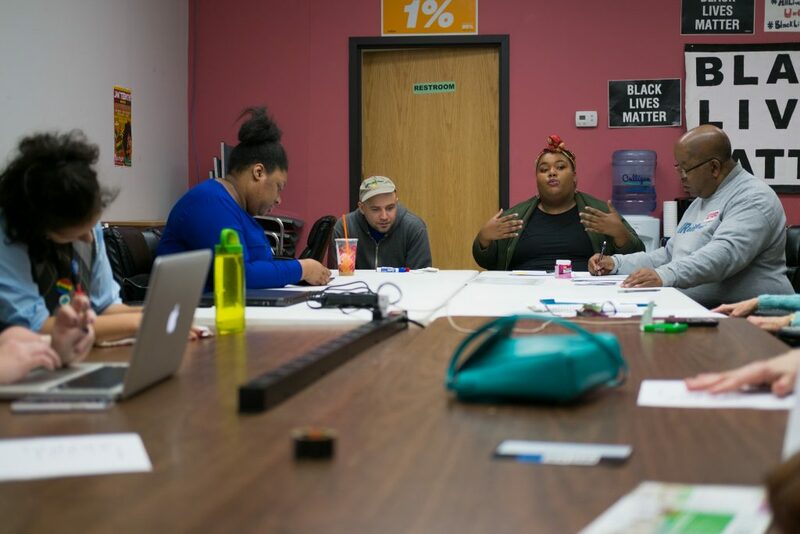 During their first meeting, organizers discussed roadblocks to securing equitable housing for Binghamton tenants and proposed solutions and strategies. Amber Johnson, a community organizer with Citizen Action of New York’s Southern Tier chapter, led the discussion. Most of the new group’s members are community activists and organizers for other advocacy groups such as Citizen Action, Progressive Leaders Of Tomorrow and We Must Live, another housing advocacy coalition. The kickoff meeting began with a general discussion of the issues related to safe and affordable housing in Binghamton and then transitioned into discussing their purpose as a group. Later, it focused on discussing an overall strategy for the organizers. The group plans to aid renters by providing resources to those who have been exploited by landlords or need to seek financial aid for housing. The group also addressed issues with many landlords in Binghamton, such as failing to address safety code regulations and strategies for lobbying lawmakers in Albany. The group emphasized the need for adjustments in the law to protect citizens from exploitation, like implementing rent control laws and relaxing rules for applying to low-income housing. Johnson cited increasing gentrification in the center of Binghamton as a motivator for increased community organizing. Aviva Friedman, ‘14, a community educator for Family Planning of South Central New York, attended the kickoff meeting. She mentioned that the University should be wary of its impacts as a force of gentrification. Pete Nagy, a deputy director for New York Communities for Change, a New York City-based coalition dedicated to social and economic justice, attended the meeting and voiced his frustration with the current housing environment downstate. Nagy discussed a broad range of issues related to affordable housing across the state, such as landlords exploiting loopholes to rapidly inflate leases. Nagy emphasized lobbying for equitable policies at a local and state level, such as universal rent control and creating public housing where necessary. He discussed the rent stabilization act in New York, which tightened regulations and rent controls on low-income housing but was limited to apartments downstate. According to Nagy, the media should balance coverage of the housing crisis across the state. Despite his disappointment with the current state of affairs for affordable housing across the state, Nagy said he sees an optimistic future for protecting tenants’ rights through community organizing. “For the first time in 12 years, I feel hope,” he said.